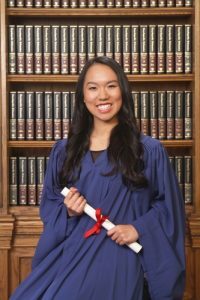 We are pleased to introduce you to the winner of 2016 Nadine Marshall Scholarship, Karmen Leong! As an aspiring teacher, Karmen strives to inspire and be inspired through new challenges and experiences to turn ideas into movements of change. At Eric Hamber Secondary School, she was privileged to have many opportunities to grow to become an impactful leader of the community. These positions included Co-Editor In Chief of the school yearbook, Editor In Chief of the school newspaper and an executive member of Service Club, Web Team and Kids Help Phone Club. In her grade 12 year, she was also selected as 1 of 18 peer counsellors to guide and provide emotional and educational care to her fellow students while implementing a safe environment for all to thrive. With the desire and drive to refuse injustice, Karmen established a healthy school breakfast fundraiser, the Breakfast Project, to fund for an inner city elementary school breakfast program. Karmen also helped jumpstart a zero waste high school mentorship program to encourage elementary school students to problem solve and start new initiatives to address environmental concerns in the community. She was also part of the planning committee for both TEDxYouth@HamberSchool as well as the VSB Sustainability Conference. As an active athlete, she shared her passion for sports by serving as an assistant coach of a local soccer team to encourage equality, tenacity and patience for kids with developmental disabilities. In addition, Karmen also achieved a 4.0 Principal’s List academic standing throughout her high school career. In the fall, Karmen will be studying Kinesiology at the University of British Columbia to learn and expand on ways she can act to help herself and others achieve a higher quality of life. She feels incredibly honoured to be receiving this award. She strives to possess the same inspiring qualities of Nadine Marshall and the unwavering belief that the power of kindness, love and open-mindedness is an agent for positive change in our world.